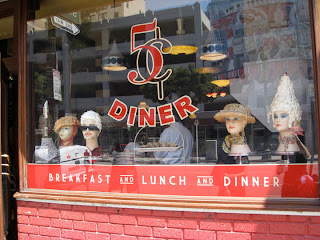 Nickel Diner, “Home of the Maple Glaze Bacon Donut”, screams fun and whimsy from the front window display; a collection of vintage mannequin heads festooned with pie crust hats and meringue hairdos. Customers line up to feast on comfort food or healthier fare featured on the cozy eatery’s eclectic menu. Vegetarians/vegans, don’t let the bacon donut scare you, there are plenty of options for non meat eaters and lactose intolerants alike. However, if you are lactose intolerant, I suggest getting your Lactaid on, big time. You don't want to miss out on the “Smac and Cheese with roasted tomatoes and bread crumbs” and some truly tantalizing desserts. The “Smac and Cheese” at $7.50 is an almost perfect representation, IMHO. For starters, it has the right consistency with a delicate balance of creaminess and cheesiness. There’s nothing worse than botched consistency like noodles floating in a soupy white sea of watery cheese sauce, or extra greasy, overly buttered, noodles. Ick! In addition, the crispy bread crumb top is artfully done, a few chives resting atop golden crumbs and Parmesan shavings. Melted into the top of the dish are two tasty roasted tomatoes that give the “Smac” a dash a color and your daily allotment of Vitamin C. That’s right, it’s good for you. 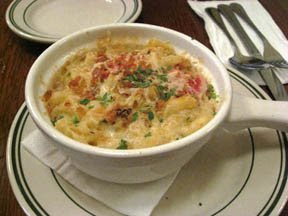 Fellow M&C aficionado and bff, Vanessa Rosenblum, appreciated the use of traditional elbow macaroni noodles as well as the combo of cheeses. We thought we tasted a mixture cheddar, Swiss and Parmesan but we’d probably lose a Top Chef taste test on that one. Suffice it to say the cheese was zesty. The special ingredient, responsible for the “Smac”, is green jalapeno peppers, a tiny wrinkle in what would have been a perfect example of M&C. While the jalapeno does give the dish a zing, I found it slightly overpowering. That said, I wouldn’t kick it out of bed if you know what I mean. Make sure to save room for dessert and get ready for your palate to explode. We tried a cupcake with a “secret ingredient” that turned out to be Pop Rocks! Good thing I didn’t wash it down with a Coke. Hey Mikey, she likes it. A few more breadcrumbs would have been nice however, those toasted chives made the topping taste like fried onions! So yummy.